This versatile model is capable of sleeping four to six people. But for our review, we're going to focus on the 6 person tent. This behemoth is truly a big house and will keep your family comfy when camping in the woods, oceanside, or mountainside. 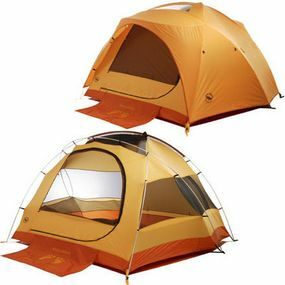 The Big Agnes Big House 6 retails for around $360. Don't balk at the price yet though--honestly, the price is reasonable for a large, high quality family tent. While Coleman tents might be cheaper, they aren't as durable and long lasting as the Big House 6. Without a doubt, a tent like the Coleman Weathermaster is larger and taller and has the spaciousness of a screened in porch--however, the durability is questionable and quality mediocre. 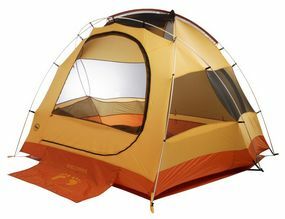 Overall, for a tent that will last your family a lifetime, the Big House 6 is a steal. However, one area of concern, is the tent's ability to repel water without the optional vestibule. You shouldn't have to buy one family tent for the dry months and one for the wetter months, but if you only camp in August, you could do a lot worse than the Big House. Maximum Interior Height: 6' 3"
Floor Size: 10'2" x 9'7"
Packed Size: 14 x 26"
Vestibule Size (sold separately): 64 sq. ft.
Campers are pleased with the ease with which they can put the Big House up. Even one person can assemble the big boy in just a few minutes. There are two large doors, both of which feature an awning-like cover to keep rain from leaking in during a downpour. The front door even has a welcome mat. A dozen mesh pockets line the inside near the floor, providing storage space for all kinds of things. The optional footprint helps increase the life of your tent by preventing abrasion, while a separate vestibule is available for both the four- and six-person models, adding and extra 52 to 64 square feet to the interior. A lot of users think the add-on vestibule should come with the tent, but it doesn't. Without the vestibule, the tent has problems in heavy rain. Also, for some reason bugs seem to be attracted to the tent. Yuck (and weird, right?) This is possbily due to the material used on the tent. While this is pure speculation (after all, aren't bugs attracted to smelly campers everywhere? ), the number of reports on this is way too high for us to ignore it and not report. Finally, the wrap-around mesh design is great for ventilation on warm nights, but it doesn't provide any privacy, forcing you to put up the rain fly if you need to change. In terms of interior space, ease of assembly and accessibility, the Big Agnes Big House 6 tent is hard to beat. 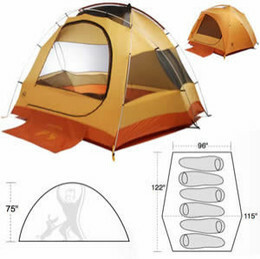 It is ideal for families that want a dome tent as a home base when car camping. It isn't bulky when packed up, and it's so simple to pitch that you can have the kids do it while you start cooking. Although it'll cost you can extra $100+, we recommend you opt for the add-on vestibule to provide better rain protection and more privacy. MooseJaw - We're loving this company more and more everyday! Amazon.com - Who likes no sales tax? We do! We do!